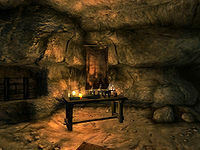 Leafrot Cave is a small cave far east of Bravil containing undead (quest-related). 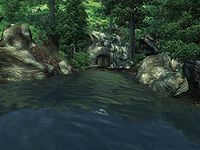 It contains two zones: Leafrot Cave and Leafrot Hollow. You can enter and fully explore this cave without starting the related quest. However, Celedaen and his journal, The Path of Transcendence, will not appear unless the quest has been started. This cave contains 10 Wisp Stalk plants. 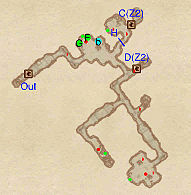 This location's map marker (M on map) is named Leafrot Cave (editor name LeafRotCaveMarker). The entrance door is NNE of the marker, 30 feet away. If you are on the quest, the quest-related book The Path of Transcendence can be found on the table in the first room (at F on map). The only other treasure of interest, apart from an unusually high number of Novice Alchemy apparatus, is the Destruction skill book The Art of War Magic, on the bottom shelf of the right-hand bookshelf (G). The corridors that depart from the southeast of this room mostly contain enemies. Be sure not to miss one of the chests, hidden from view by a large stone, in the long corridor just to the right that ends in a rockfall. 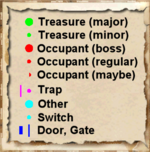 There are two options for accessing the second zone: door C or door D. Door C can only be used if you unlock the leveled lock on door H. However, it's not necessarily worth the trouble of unlocking door H: the two extra rooms to which you gain access only contain a Skeleton corpse and a minor loot chest. 1 The Path of Transcendence at location F on map (only present if you have started related quest). You can enter this zone using either door C or door D; however, only door D can be used to return to the first zone. Door C leads to an upper level room; you can drop through a hole in the floor (covered by two rotten planks, T) to get from the upper level room to the rest of the zone. Unless you are on the related quest, this zone will not contain any enemies. It will always however contain three minor loot chests.